One of the greatest works by 16th-century Florentine painter Jacopo da Pontormo (1494–1557) is on display in Los Angeles for the first time. 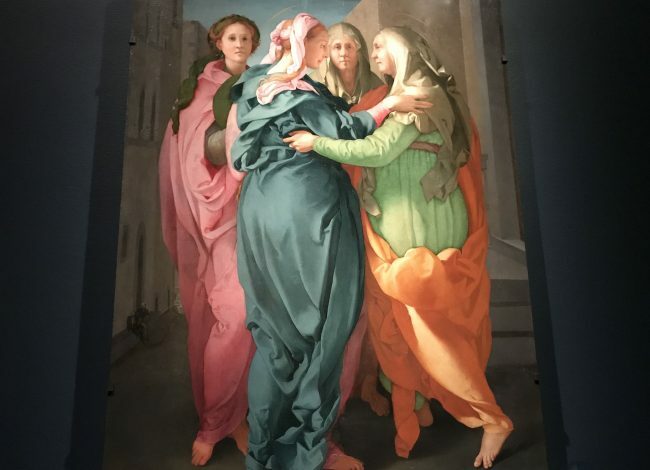 The “Visitation,” a rare altarpiece by Pontormo that until recently could only be seen in Italy is at the J. Paul Getty Museum through April 28, 2019. The eye-catching piece features intense, brilliant colors in an almost Impressionistic light. The work is seen as part of an exhibit – “Pontormo: Miraculous Encounters” — organized by the Getty along with Florence’s Gallerie degli Uffizi and the Morgan Library & Museum in New York. The gallery featuring the “Visitation,” preparatory sketches, and other key portraits by Pontormo demonstrates the artist’s innovative style. Historian Giovanni Cinelli wrote about the altarpiece in 1677. However, it remained virtually unknown until 1904, when it was rediscovered in a small parish church in Carmignano, a town west of Florence. Until recently, one had to travel to Carmignano to see the masterpiece. The painting’s recent restoration led to the opportunity for the work to travel to the U.S. Removing old layers of varnish during the restoration brought Pontormo’s vivid palette back to life. It also uncovered features that had become concealed over time, such as the two male tradesmen in the bottom left corner and a donkey peeking out from the background. The more than six-foot-tall Pontormo altarpiece shows the moment of encounter between the Virgin Mary and her cousin Elizabeth in vibrant hues. The woman reveal to each other that they are pregnant, respectively, with with Jesus and John the Baptist. Pontormo created a version of the meeting that takes place on the streets of the town where Mary went to stay with her cousin. The artist eliminated many narrative details to place an intense focus on the two sacred larger-than-life figures and their female attendants. Pontormo did add some quirky elements that one sees up close along with the background buildings that frame the scene. There is a housekeeper hanging a cloth out a window along with the two tradesmen and donkey. 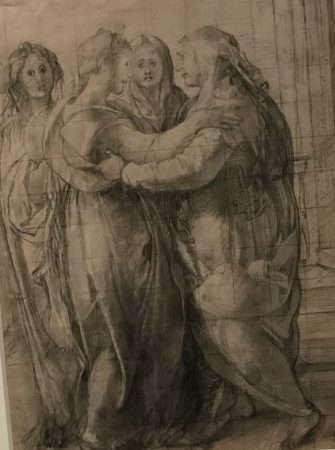 The “Visitation” is shown alongside its only known preparatory drawing, loaned by the Uffizi. Done in black, white and red chalk, the sketch demonstrates that the artist’s uncertainty about how to position his characters given some of the contours drawn around the feet. The paintings and drawings were made by Pontormo between 1528 and 1530, during a political crisis and siege in Florence. Republican troops had driven out the Medici family in 1527, but ensuing clashes eventually returned the Medici to power. 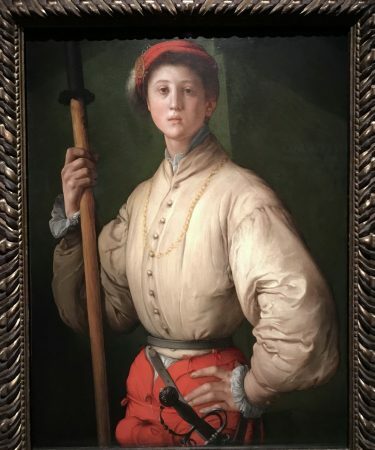 “Portrait of a Halberdier,” 1529-1530, a well-known painting in the Getty collection, shows s a young man dressed as a soldier. The painting is believed to be of a young nobleman named Francesco Guardi. However, some speculate that the subject may have been the future Grand Duke, Cosimo de’ Medici. “Portrait of a Young Man in a Red Cap” was created during the same timeframe. This painting shows another young man working to defend the city, Carlo Neroni. Known to scholars through documents, the work was thought lost until it was rediscovered in 2008. This showcase offers the public a rare change to view this piece, which belongs to a private collection. 2 Responses to "Rare ‘Visitation’ by Pontormo Altarpiece at Getty"